After observing several years worth of competitions, I would like to participate in this years event. I know that Ulrich posted a Kohlenkipper some time ago and I did indeed take much inspiration from that. However, I found a series of fascinating postcard style images sometime ago that really struck me. I am submitting a small scene depicting a Coal Tipper unloading onto a barge. It will incorporate several self made parts and several by HMV. well, what will Your coal tipper look like? I will observe Your version. Build the coal tipper for pour own before a mercantile publisher will do so. So You will have the satisfaction of having construted by Your on and by nobody else. So You will have an unicate model. @ Robi: I think we must put that new "Hafen" Forum to good use! @ Ulrich: I will make one very similar to the middle and Right pictures above. The original was one of several im Parallelhafen im Duisburg. I think you are very right in "scratch" building or "Eigenbau". Its very satisfying indeed. surely You coal tipper will work. And so a proposal, one side buil as normal, wall aso the other side openes so that the interieur is to be seen. As a master in dioramas You surely will find a way to put it into a diorama. It would be pitty not to see the principel of tipping the coal waggon. I am strictly convinced that you are one of the hottest favorites for winning the contest. May be you will have to share the first place with this man from Switzerland named Glue me (or Gloomy or Thom). May well be that he is able to build his Arado remote controlled. Whatever we will see we will see great things and it will be a big pleasure for the audience. @ Ulrich: I like this idea very well, I will be thinking on this, a way to expose the mechanism. Thank you! Least we forget, the competition last year was IMMENS! So many beautiful keels laid. And this year, several dioramas! Very exciting in all. I have finally settled on the composition of my entry. Below are a picture of the scene I wish to model and another of all of the various parts before I begin. The first of several small boats that will populate the diorama. To start, I scanned and slightly re-colored the small motor whaler from the HMV Hamburger Hafen Diorama. (I absolutely have an original as I bought three for my Hafen ). I hope all of you are starting the New Year off with a few minutes spent on our beloved hobby. to build the coal barges first is an good idea.So You can all measures form this little ships and You can adapt the coal tipper and all items will fit. So I build my dioramas too. A Happy New Year Chief Harbour Master Cris! By the way it's very fine to show us some photos of rusty oil platforms and dirty harbour equipement near Santa Barbara. But where are the pictures of the girls at the beaches there? More details please! Following Ulrich's timely advice, I have laid the keel on the Paper Trade Binnenschiff. My only complaint regarding the Paper Trade model is the 1:250 version included in the kit is a simple rescale with no refinements or accommodation for 1:250 versus the original 1:100. Thus, many of the details are faint or lost altogether and the colors are not as crisp. However, in any case a thoroughly enjoyable model to build. And, Happy Belated New Year Wishes to All! @ Ulrich: Thank you for the tip, as you can see I've taken it to heart! @ Werner: I promise that the shortage of Bikini's was not due to a lack of effort on my part! It was "Winter" there as well (16-19 degrees during the day). I modified the hull frame work as shown above to reflect the loading of coal. I used a small piece of cork painted black and coated with coffee grounds to simulate the coal. Finally, some historical photos. I wish everyone a very pleasant weekend. The image of Hamburg depicting the "Tall Ships" is by far my favorite of the many hundreds I have looked at while researching my Hafen and this project. Continuing with the Pilot House and After Deck House. @Robi: Thank you for the link. Not only was I pleased with the book you recommended, I saw several models and other books that I will order. Adding the remaining details. The Binnenschiff is nearly fertig! ...The Binnenschiff is nearly fertig! With the exception of the crew and some small deck additions such as hawsers, the Binnenschiff is complete. Next in the yard is the Welle (which in English is Wave) from HMV. "Ich bin von den Socken..."
It nearly means: I am enthusiastic! Or: I am delighted with this model. Work continues on the Welle. 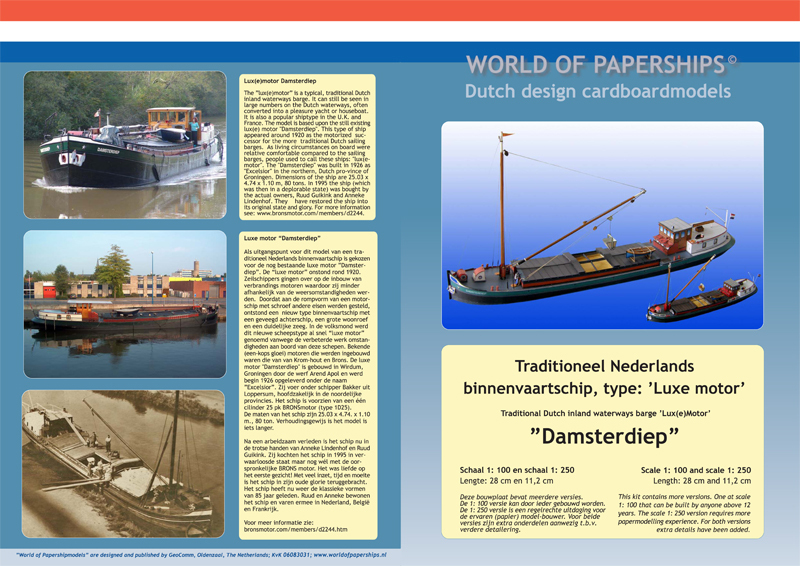 I should point out here that World of Paperships has another model that is a near perfect match for the one on the right in my reference picture (see Post #8). However, I have been wanting to build these small Küstenmotorschiffe since HMV released them last fall. I hope you will all indulge my artistic license. Also, here is a link that discusses the Adventura a restored Küstenmotorschiffe. Regarding the construction so far, I DEEPLY regret not doubling the decks. Despite being ever so careful in applying pressure, you can see where I managed to slightly buckle the deck in two spots over the formers. @ Helmut: Ah I see! Thank you so much for your support and kind words! I found this "mini-model" (indeed, I believe it and its entire cargo of coal could fit neatly in one of your current projects bunkers) to be very fun to build with many opportunities to detail. @ Thom: Thank you for your praise! I enjoy myself immensely and always try to improve on each model. But, I have yet to reach the Zen Nirvana state of effortless precision you have my friend! Clearly, more models...err practice is needed! the ship's deck. By doing so it makes the model much more interesting. Here is a link to many, many pictures of small coasters similar to the Welle. Be careful though, it will EAT time. And here are some of the vessel as she exists today. As you can see, the intervening 75 years have not been with the most shipshape of Captains! very well, good looking - the WELLE is a fine typ of Küstenmotorschiff (called "Weselmänner"), which I`ve often seen at the river Weser at the beginning of the sixties, when I grow up there in the neighbourhod of the ship-yards LÜRSSEN and BREMER-VULKAN. Thank you for your kind words. I am sure that was such an interesting time and area to grow up in. I grew up near Norfolk, Virginia which is also an area with a large amount of shipping. I suppose as well, that why I joined the Navy. You know, there is really no equivalent to these Küstenmotorschiff in the US. I find them both very beautiful and interesting. Well, until your build these Küstenmotorschiffe have not been on my list of models. Anyway the first model of this list will start being built around spring 2017, when I have finished my harbor. Hopefully. But now ... . I think I have to buy some more sheets of printed paper in Bremerhaven. After much searching, I have finally found so pictures of the Welle as she was originally commissioned. Here is the link (in Deutsch). I find the history of this little vessel fascinating. Here are some pictures from the above website that show how I wish to rig the Welle. I think close examination of them reveals the Welle has "ratlines" which is logical as she was rigged for sail. @ Werner: Hello my friend. Thank you for your kind words! I know exactly how you feel! I am already planning six projects when I still have two undone... Mia and I both are VERY excited about Bremerhaven! I am already saving my lunch money to "donate" to the Museum. EDIT: The three below pictures are Copyright Via Manfred Biedermann aus dem Archiv von Schiffbaumeister Klaus Krummlinde. The Welle is now fertig! We can now finally move on to the "star" of the diorama, the Kohlenkipper. I have included a couple pictures of the Welle at the kai in Hamburg and one historic photo. And now because I must travel to the US for business, a baupause of several days. I hope that everyone has a pleasant weekend. Fits wonderfully into the scheme! Time travel once more, 3D and Feelaround! Your harbour don't look like made out of boardcard. They are so genuine. However, work on the diorama continues. Here is a link (Deutsch) that describes the operation of several types of Kohlenkipper. I have shown below two additional historic photos of Kohlenkippers and my progress on the kipper wagon and tisch. @Ulrich und Gloomy: Thank you friends for your praise and encouragement! here You show us the following highlight of Your Art of modelling. It is uncredibel what you can make of an old model( it looks like an old Möwe cargowaggon but i can be wrong).